Abu Dhabi's rising level of development and investment, as well as its enhanced connectivity and infrastructure, have driven the popularity of the city among meetings and events professionals globally. Testament to this is the number of high calibre suppliers already registered to attend IBTM Arabia 2018, the most established event of its kind in the Middle East (meetings, incentives, conferences and exhibitions) Mice industry, taking place at Jumeirah at Etihad Towers in Abu Dhabi, from February 5 to 7 this year. Leading international suppliers confirmed to attend the event include the Azerbaijan Convention Bureau, Czech Tourism Authority, Interprefy, Norwegian Cruise Line, Singapore Tourism Board and the United Nations Conference Centre. Regional suppliers include Atlantis The Palm, Fairmont Ajman, Fujairah, Jumeirah Group, Matrix Audio Visual Entertainment, Ras Al Khaimah Tourism Authority, Rotana Hotels and Resorts and The Waldorf Astoria Ras Al Khaimah. They will be joined by hosted buyers from organisations including AIM Group International, ALJ – Toyota, American Express Travel Services, Continental AG, Danone, Firmenich, GSK, Saudi Telecom Company and United Spirits Ltd, from countries including Italy, Malaysia, Saudi Arabia, Spain, the United Kingdom and the United States. According to the latest IBTM Trends Watch Report, launched at IBTM World in Barcelona, the Middle East is a maturing market, becoming a major player on the international meetings and events scene, thanks to its high standards of delivery both on the supply and demand side. The report quotes the Advito 2017 Industry Forecast that is seeing fleet expansion by Emirates, Qatar Airways and Etihad Airways, to meet the growing demand in the region – up 11.2 per cent – allowing international delegates easy access to meetings and reducing the cost for international event planners. Shinu continues: “As well as this, there is an excellent support mechanism in place for event organisers in the city, headed by Abu Dhabi Convention Bureau and, on a wider scale, by Abu Dhabi Culture & Tourism Authority, with whom we have partnered since inception in 2007. The increasing demand in the region and the host city of IBTM Arabia is backed by latest industry reports showing that four and five-star hotel construction continues to grow, with room occupancy typically ranging between 80 per cent and 85 per cent in popular destinations like Abu Dhabi. On Abu Dhabi’s Mice offering, Shinu comments: “When IBTM first held an exhibition in the area, in 2007, the regional MICE industry outside of Dubai was only in its infancy. Incentives were largely absent from a wider landscape and large-scale meetings simply couldn’t be supported as venues were not yet built. Now, Abu Dhabi experiences a huge level of ongoing investment and development, meaning that new venues launch every year. “A perfect example is the new Louvre Abu Dhabi which opened last month, with the Guggenheim and further major attractions due to open in the near future, adding to the city’s attractiveness in the eyes of event organisers and delegates. 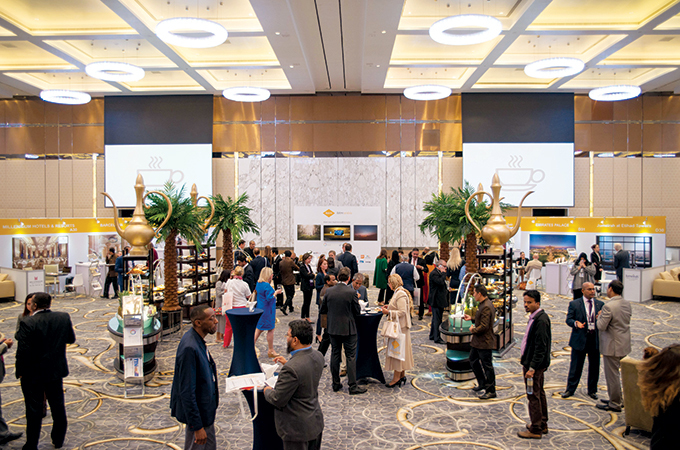 The networking programme will kick off with a ‘Discovery Day’, introducing suppliers and Hosted Buyers to some of the highlights of Abu Dhabi, whilst giving them the opportunity to network with each other and key media. This year, Discovery Day will include a trip to the new Louvre Abu Dhabi and the opportunity to experience some of the delights of Yas Island. IBTM Arabia’s market-leading Knowledge Programme allows attendees to take tangible learnings back to the workplace and ensure their finger is on the pulse of the latest industry talking points and developments. This year, the programme will be headlined by keynote speaker, Rohit Talwar, global futurist, author and CEO of foresight firm, Fast Future. The programme will also include a panel session led by ICCA (International Congress and Convention Association) on destination competitiveness. On the final day of the event, attendees will take away learnings from a session by Albert Dias, Chief Technology Officer and co-founder of the UAE's first full-service OTA – Musafir.com.